There was a time when, though I never thought “I knew it all”, I thought I did have a fairly clean grasp on what it meant to be a stellar parent…that was until I became one. I remember being so righteously indignant over parents who dared to gripe about the hardships in parenting as we journeyed through infertility. After all, did they not realize what an amazing gift they had been given? I remember promises I uttered to God, things like, “I will never take one poopy, sleep deprived, rebellious moment for granted if I become a mom…” I just have to sit back now and wonder, was God smiling at my words or having a full on belly laugh? Now, almost 8 years after God granted me mother status I can honestly say, while completely well intentioned, I had no idea just how hard parenting could really be. I remember setting eyes on each of our girls for the very first time. I was in love. Head over heels, lay my life down, let me hold them and kiss them until the end of time, in love. It did not matter a smidgen that 4 of our 6 girls did not come from my womb. The love was an instantaneous, God breathed sort of moment…at least on our (the parents) end. And so, one October day God gave us a beautiful, tiny baby girl that we later named Emily who was just 10.5 months old and weighed in at just l6 pounds. Exactly one week later, we brought home two lovely, funny, and very resilient young ladies who would later be named Rachelle and Ariana, ages 13 and 14. I was 25. Just a couple months later, on our last try of infertility treatments, we found out we were pregnant with twins. And several years later, I would have the honor of watching our youngest, Annastacia, come into this world and take her very first breath. We were beyond excited about every single one of our kids. Did we know it was going to be hard? Sure. Did we have any true clue on just how difficult the journey would be? No fricken idea! We faced so much at that season of our lives, battles at every side. A question kept pulsing in my mind, “Do I trust God?” And then a nagging, gentle whisper, “will you let them go?” In that year, we began to learn that we were not in control of this story. In fact, we could control precious little. And to be totally honest, I was scared. I loved them all so deeply, I didn’t want to let go of even one, not even for a moment. At 17 weeks pregnant, my water broke. My world started to spin. I waited at the hospital for my labor to begin. At just 17 weeks they were too little to survive. Every single cell in my body screamed out to God. “NO!” Through uncontrollable sobs, I whispered that I did NOT trust Him. He could not allow this to happen. This crazy, messy story was not MY plan. It was not what I wanted. I stayed pregnant until I was 21 weeks, and then I gave birth to a tiny baby girl we named Ashley Faith. She lived for 15 minutes and died quietly in my arms. My labor stopped and at 24 weeks I gave birth to another tiny baby girl we named Bethany Grace who also lived for 15 minutes. I was crushed. At their funeral I remember sitting, staring at the tiniest pink casket with wonder. The horror and shock had subsided a bit and I was full of sorrow. I had done all that I could do, but I could not save them. I had to let them go. And so, through tears I prayed, “God, I do not know how to trust you. I don’t know how to do this hard. Please help me to trust you.” And then something powerful and amazing happened. A song of praise filled my heart, the words and melody beating loudly through my chest and a peace that truly surpasses understanding filled me. I had wanted so much to be able to save them, to protect them. Instead, when I had done all that I could do, I had to let them go, and I chose to trust God to care for them. I was beginning to learn what it would mean to truly trust God, not just give it lip service. And then, I would fight God all over again when the next battle came. Life went on, and at the time we had three other daughters to care for and walk with, now there are 4. There were problems, there are problems. Issues would be faced, and I would want to swoop in and save the day…until the day came that I realized I couldn’t. 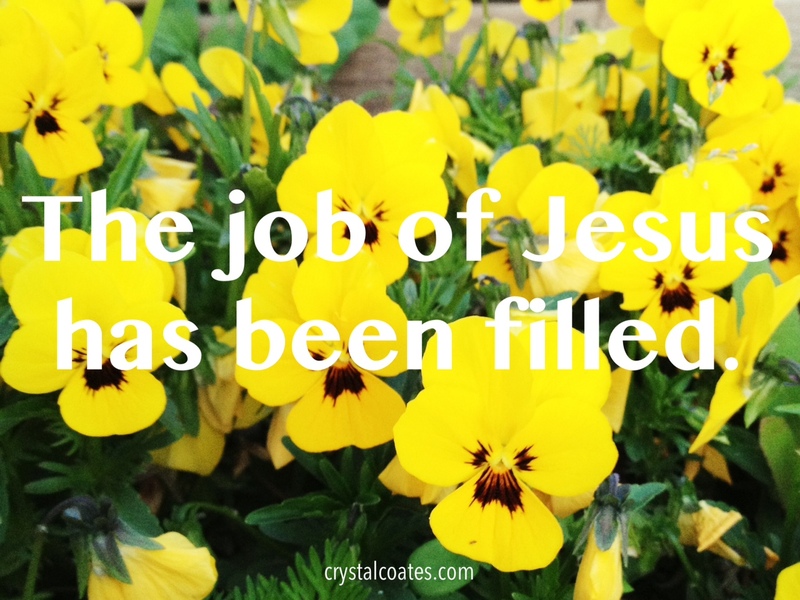 And patiently, lovingly, God reminds me, (sometimes a few dozen times a day) that the job of Jesus has been filled. I can rest in his grace. I can let them all go…every single precious, beautiful, amazing child he has given me. And when I think I can not endure another moment, I cannot bear up under one more trial… I run to the one who sustains me and I choose to trust Him. There is freedom in letting go, and where there is freedom there is profound beauty. I have learned again and again….God’s grace is truly sufficient, and he is worthy of all my trust, especially in the hard. I do not need to be in control because He is and He is able to carry me through every bit of hard I will ever face.